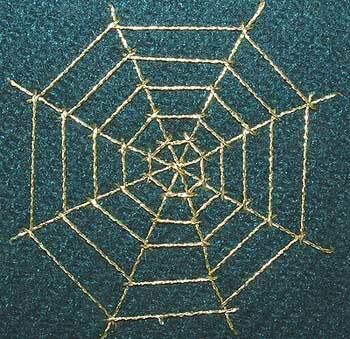 Todays detail is a spider and her web…below are instructions for stitching a spiders web and spider for yourself. Start by laying down the spokes of the web, follow the above images bringing the needle up at the capital letters and down at the corresponding lower case letter…To finish bring the needle up at the centre and take a tiny stitch over all the threads to bring them together. 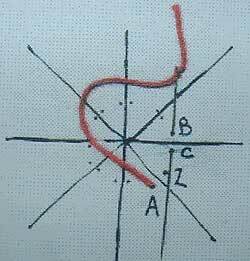 A short distance from the centre bring the needle up at A…then put the needle down at B and up at C…Repeat B C for each spoke untill you get back to the first spoke where you go down at Z…When stitching the web ALWAYS keep the loop of the thread towards the centre of the web. Repeat ABCZ in concentric circles around the centre of the web. 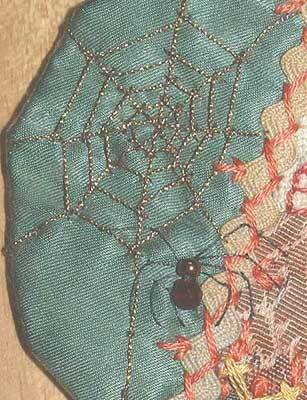 There are as many different crazy quilt spiders as there are spiders in Nature…Here is just one method of creating a spider. 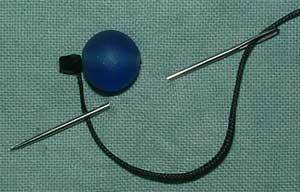 Choose 2 Beads, one a little smaller than the other and stitch them side by side. The legs are Fly Stitch…Bring the needle up next to the smaller bead, Put the needle down at the end point of the leg and bring the needle up at the bend in the leg with the thread under the needle, take a small stitch over the thread to seal the stitch….Repeat for each leg, 4 on each side. Don’t stress at trying to get the legs even, as long as they have a body, thorax and legs they mostly look like spiders, those that don’t still look like bugs, which are often found in spider webs anyway. The first spiders I stitched where somewhat odd looking and I call them my Mutant spiders. 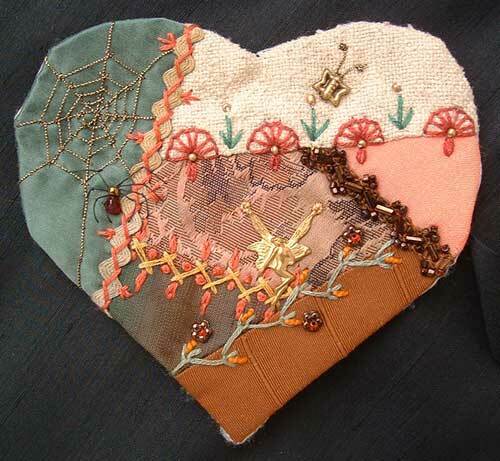 Details 24 to 27 are from this heart, I have stitched it wrong sides together with interfaceing which I cut a slit in so that I could turn the heart right sides out, it is now ready to applique onto my boxtop. Eu gostei muito de suas aranhas. Vim buscar inspiração nelas para fazer um de meus trabalhos. Gostaria de lhe agradecer por isso. Translation: I liked its spiders very. I came to search inspiration in them to make one of my works. It would like being thankful to it therefore. Very obliged. A smack. what an idea! !with your goodluck….i have save as . Oi Anie, all good with you? I adore its blog. I learn very with it. That always necessary of aid or inspirations, step pra to look at its work here. Debtor for its generosity. Kisses of Brazil.